There’s nothing like a good illustration to hammer home a message or invoke a strong, primal response from your users. You can test any kind of illustrations or visual art, but remember that your demographic targeting in these tests is critical. If you can recruit your own participants, then you’ll get closer to their preferences rather than to those of more randomly chosen participants. In addition to this, it makes sense to gauge where your test participants sit on issues that might affect their preferences with simple Question sections. This example test is a great demonstration of this technique. Sending emoji in a dating app is not for everyone — so simply filter out the responses from participants who wouldn’t use this feature to get a more relevant view of the results. 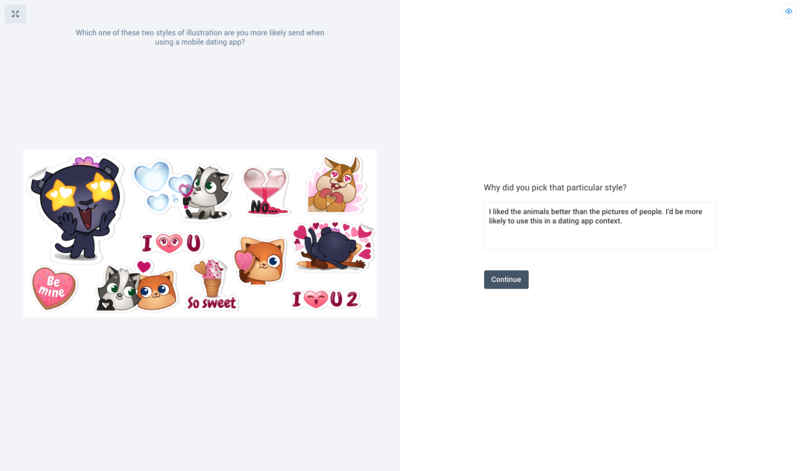 This kind of testing can also uncover directly contradictory feedback from participants, and art preferences are oftentimes irrational or swayed easily by personal tastes. Look for consistent, strong preferences or comments that keep coming up around similar details. The results of this example show a pretty even split in opinion. Illustration A is preferred by those who want a more mature approach, whereas Illustration B is regarded as cute and playful. The target audience and the overall theme of the dating app will dictate which of these illustration styles is the way to go. Remember that ultimately, your art style is a reflection of your brand and personality, and it’s impossible to make art that pleases every single person. Use these tests as data points and sense checks rather than winner-takes-all decision-making engines.